Wireless communications is a technology that is used every day. Across society, there is a move away from using the internet on desktop computers and towards smartphones, tablets and laptops. 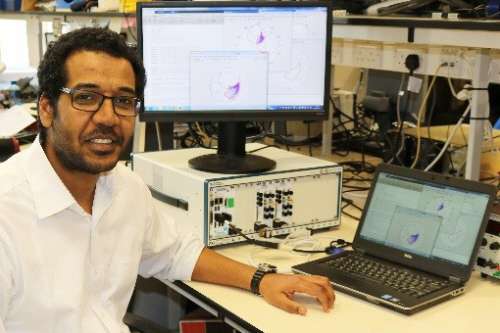 Engineers at the University of Bristol have developed a novel radio frequency (RF) design tool that will speed up the design of tuneable wireless devices and will enable smartphones to roam internationally. The research, in collaboration with the University of Sheffield, is addressing the simultaneous multi-band operation of wireless systems through the co-design of both hardware and software sub-systems. The paper, conducted as part of the EPSRC Frequency Agile RADio (FARAD) project, is published in IEEE Transactions on Microwave Theory and Techniques (T-MTT). Wireless connected devices are now an integral part in people's work and social lives and it is playing a growing role in healthcare technologies. The advent of 5G will create further disruption or step change in everyone's use of wireless technology. Today smartphones are at the heart of this evolution as prices decrease and functionality improves, making them the first choice for internet access. Everyone wants their phone to offer higher data rates and work seamlessly throughout the world but because of the different frequency channels this isn't always possible. Dr Eyad Arabi, Research Associate in the Department of Electrical and Electronic Engineering, the lead author, said: "For smartphones to operate globally, phones need to tune or switch bands, ideally without compromising performance. Such frequency agility poses tough design challenges due to the increased complexity and physical size of the tuneable system. At Bristol, we have developed a novel radio frequency (RF) design methodology that will ensure the efficient design of tuneable wireless devices." Mark Beach, Professor of Radio Systems Engineering in the Department of Electrical and Electronic Engineering: "For efficient RF design an understanding of the electrical dynamics of the tuneable components is essential. Bristol's new tool will allow the designer to visualise the tuning range or coverage of the tuneable components, speeding up the design of antennas, filters and amplifiers used in smartphones." Dr Kevin Morris, Reader in Radio Frequency Engineering and Head of the Department of Electrical and Electronic Engineering, added: "This work allows flexibility to be brought into the design process which will significantly increase the ability of future 5G amplifiers to work over multiple frequency ranges and lead to a single handset that could be used around the world."